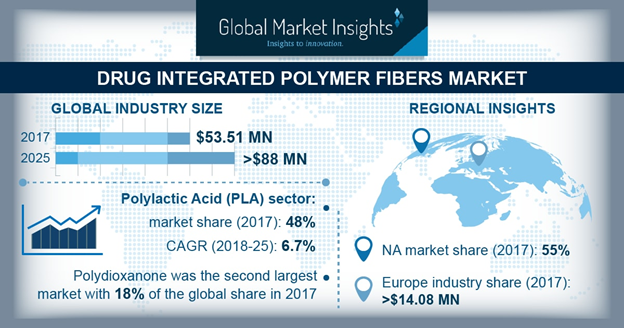 Drug Integrated Polymer Fibers Market to Exceed $88.8 Mn by 2025: Global Market Insights, Inc.
North America drug integrated polymer fibers market to account for more than 55% share by 2025 due to usage in implantable textile devices. SELBYVILLE, Del., February 11, 2019	(Newswire.com) - ​The Drug Integrated Polymer Fibers Market revenue is expected to grow from USD 53.51 million in 2017 to USD 88.8 million by 2025, according to a 2019 Global Market Insights, Inc. report. A rising population, improved healthcare facilities in developing economies, growing implantable medical surgeries, technological advancement in medical textile engineering along with a rise in R&D activities to replace traditional materials with innovative biomaterials will primarily drive the drug integrated polymer fibers market until 2025. Drug integrated polymers fibers are generally made from biodegradable and biocompatible materials such as polylactic acid and its derivatives such as PLLA, polydioxanone, polycaprolactone, polyglycolic acid, poly(lactic-co-glycolic acid) and other copolymers. These fibers also called as pharmaceutical fibers and can be loaded with variety of drugs. These fibers are generally available in woven, knitted or braided form for a medical textile device. These fibers find wide applications in orthopaedics, drug delivery, vascular grafts and stents along with dermal healing. Although the market for drug integrated polymer fibers is very small at the moment, it is expected to rise significantly during the forecast period because of the rise in innovative materials globally for orthopaedics, and the rise in the elderly population, especially in the European and North American continents. Drug integrated polymer fibers have been typically manufactured through melt extrusion at high shear and high temperatures – conditions that have severe limitations on pharmaceuticals and biologics. To address these concerns, a wet extrusion method has been developed for manufacturing drug-loaded fibers, which occurs at lower temperature and has low shear stress. In wet extrusion process, a solution of polymers is put to pressure and is injected in a coagulating bath comprised of solution that is miscible with solvent which dissolves the solvent. Progress in topical fiber-based biologics and pharmaceuticals, along with a breakthrough in regenerative medicine and tissue engineering, are paving the next generation orthopedic medical products market. Controlled pharmaceutical delivery through biodegradable fibers has the potential to revolutionize many applications including orthopaedics. Usage of traditional surgical methods in developing nations, along with the high cost of drug integrated polymer fibers, are some of the factors that can restraint the market from its full growth. Drug integrated polymer fibers are being widely used in a variety of biomedical applications as it exhibits both biocompatibility and biodegradability properties both highly important for medical textile applications. Biodegradable polymers such as PLA, PLLA, PGA, PCL involves cost-effective production and can be upscaled easily with less complicated machinery. Also, the mechanical properties along with the degradation kinetics of these polymers can be tailored to match the requirements of intended applications by controlling curing temperature, curing time. Because of the flexible and fibrous nature of these polymers, its medical textile applications have mainly targeted soft tissue replacement and the engineering of soft tissues, such as cardiac muscle, blood, nerve, cartilage and retina. A large number of companies are expected to enter this business due to the unknown hidden potential of these fibers in drug delivery. Source: Global Market Insights, Inc.
About Global Market Insights, Inc. Global Market Insights Inc. is a global market research and management consulting company catering to leading corporations, non-profit organizations, universities and government institutions. Corporate Sales, USA, Global Market Insights, Inc. The U.S. parenteral nutrition market dominated the North American region accounting for more than USD 1.2 billion in 2018 owing to a rise in awareness about parenteral nutrition along with a growing incidence of chronic diseases. Pumps Market Share to Cross US$91bn by 2025: Global Market Insights, Inc. In 2018, the portable pumps market crossed at over USD 13 billion, is expected to grow at 2.6 percent CAGR during 2019-2025. Pumps are generally used in emergency applications such as fire brigade and industrial dewatering. Polymeric Sand Market to Hit $85M by 2025: Global Market Insights Inc.
Polymeric sand market share from patios application segment shows a significant growth rate of around eight percent from 2019 to 2025 driven by rising demand for luxury homes with better amenities and outdoor living spaces in the developing countries.